Swandown is a travelogue and odyssey of Olympian ambition; a poetic film-diary about encounter, myth and culture. It is also an endurance test and pedal-marathon in which Andrew Kotting (the filmmaker) and Iain Sinclair (the writer) pedal a swan-shaped pedalo from the seaside in Hastings to Hackney in London, via the English inland waterways. 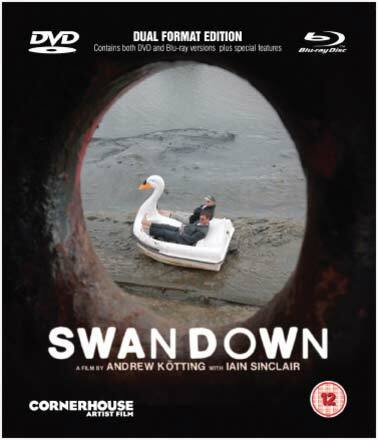 With a nod to Werner Herzog's Fitzcarraldo and a pinch of Dada, Swandown documents Kotting and Sinclair's epic journey, on which they are joined by invited guests including comedian Stewart Lee, writer Alan Moore and actor Dudley Sutton. This was a perilous journey, akin to the river voyage of Bogart and Hepburn in The African Queen. It was also, for Kotting, a tribute to the legendary performer, traveller and conceptual artist Bas Jan Ader, who in 1975 was lost at sea attempting to cross the Atlantic in a pocket cruiser. Swandown is a travelogue and odyssey of Olympian ambition; a poetic film-diary about encounter, myth and culture. It is also an endurance test and pedal-marathon in which Andrew Kotting (the filmmaker) and Iain Sinclair (the writer) pedal a swan-shaped pedalo from the seaside in Hastings to Hackney in London, via the English inland waterways. This was a perilous journey, akin to the river voyage of Bogart and Hepburn in The African Queen. It was also, for Kotting, a tribute to the legendary performer, traveller and conceptual artist Bas Jan Ader, who in 1975 was lost at sea attempting to cross the Atlantic in a pocket cruiser. This dual edition DVD and Blu-ray release includes caption subtitles, and 43 minutes of extras including the short films Glitter and Storm by Rebecca E. Marshall, Random Acts and Bunhill Fields, an excerpt from the Filmmakers' Q&A, and the film trailer. Swandown was commissioned by the Abandon Normal Devices (AND) Festival and premiered at Cornerhouse, Manchester, 2012.